Who doesn't love a few plants in the house? 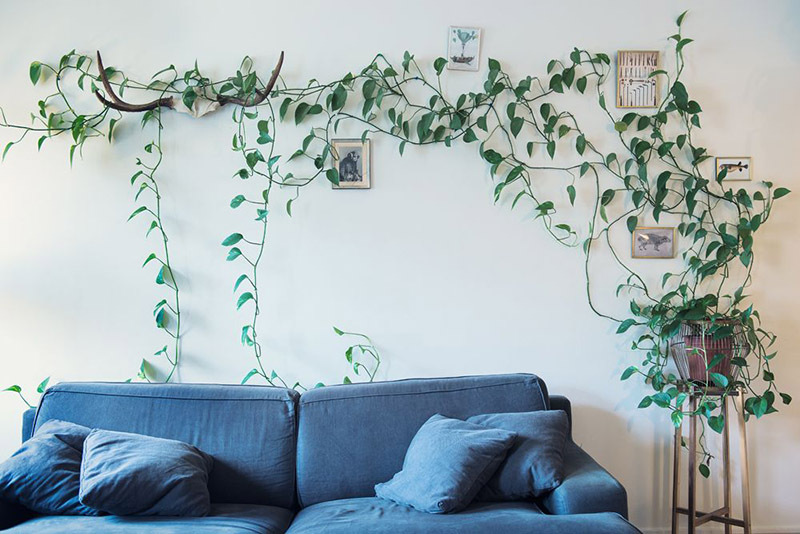 A home without a plant just doesn't seem right. Especially these days when having a collection of house plants is particularly on trend. I personally love that plants are on point because I love plants! However, you might not be so keen on the houseplant/garden trend because you just can't seem to keep anything alive! Believe it or not, I've been there! Even though I've gotten a lot better at tending plants over the years, I wasn't born with a green thumb and sometimes sadly suffer a plant casualty here and there. So I'm here to tell you that there is hope! With a few simple tips and the right plants, even you can have a beautiful, thriving indoor garden. The key to keeping plants alive is to pick the right plant and know two important details about that plant: how much water it needs and how much light it needs. I find that the first of these two things is the most important and where the most mistakes are made. Once you know how to water your chosen plant, everything should be smooth sailing from there! Now let's talk plants. 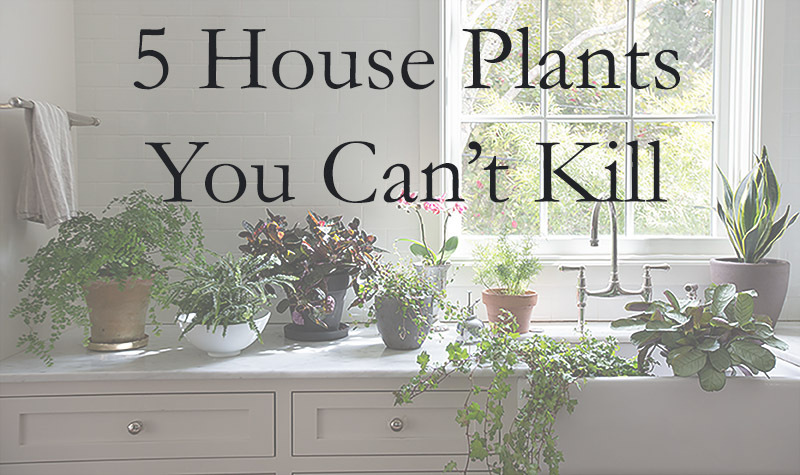 Here are five trendy plants that will take your home decor to the next level and are incredibly easy to keep alive. Succulents are extremely popular right now! Love them or not, I don't think anyone can deny that these little trendy plants are adorable and incredibly interesting with all the varieties of shapes and colors. Oftentimes though, people think that the only succulents are the plants pictured above, but as we'll see soon, there are plenty of other varieties of plants that are also in the succulent family (and easy to take care of). So if you're not a fan of these, stay tuned for some other options! Some people have mixed feelings about how easy succulents are to grow. You may have already killed one yourself! However, succulents are incredibly easy to keep alive if you just leave them alone. The biggest mistake people make with succulents is trying to give them too much love. Succulents thrive in dry soil with only light watering once a week at most and indirect sunlight. They might seem like desert plants that would love some strong sunlight, but they will actually burn in strong light. So a nice soft light and minimal watering every once in awhile is all they need to liven up that little shelf in your bedroom. Similar plants to look for would include aloe and jade. 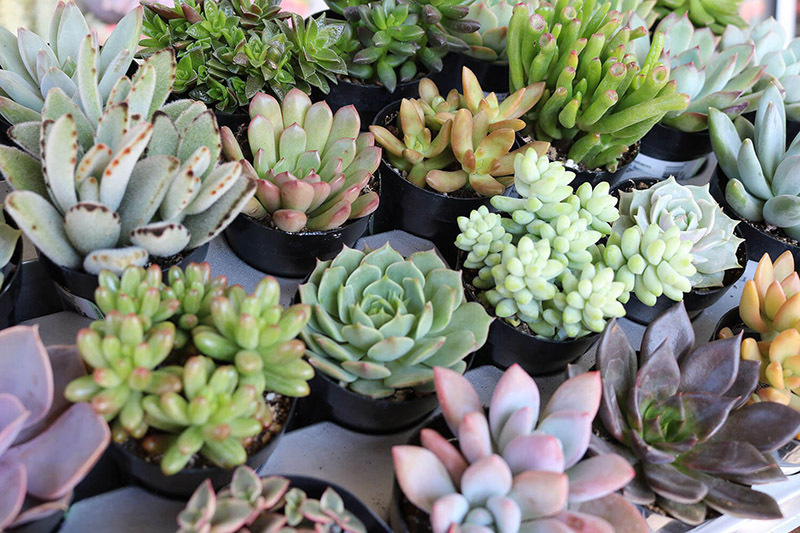 All succulents have one thing in common, they don't need as much water as you think! You can usually spot a succulent (and its need for dryer soil) by its thick, rigid, and often plump looking leaves. Succulents make a great choice for people who often forget to water their plants or who travel a lot. Interested in getting some cute little succulents for yourself? Check out The Succulent Source! They have everything succulent and ship them straight to your home! Also known as mother-in-law's tongue, this plant is a winner (and also a succulent). I currently have two of these on my mantle, and I honestly forget that they're there. I'm surprised that they look as good as they do because I easily go two months without watering them, they get almost no sunlight, and the heat from my fireplace in the winter can be intense. Yet, there they are! Seriously, this is a great plant to start with. If yours does die, I would suggest getting another one and trying again because it probably wasn't even your fault. I'm convinced that these plants just decide to die when it's their time and that's it because mine should have died a long time ago by the way I treat them. 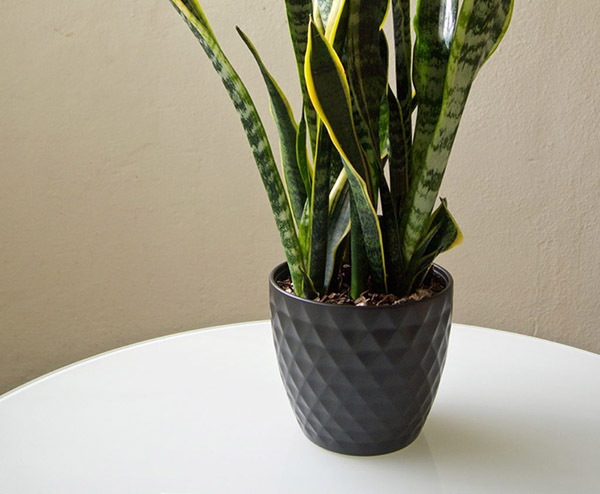 Even though they might not look like it, snake plants are in the succulent family so the only way you might kill this plant is by watering it too much! Let the soil dry out for awhile before you water it again. 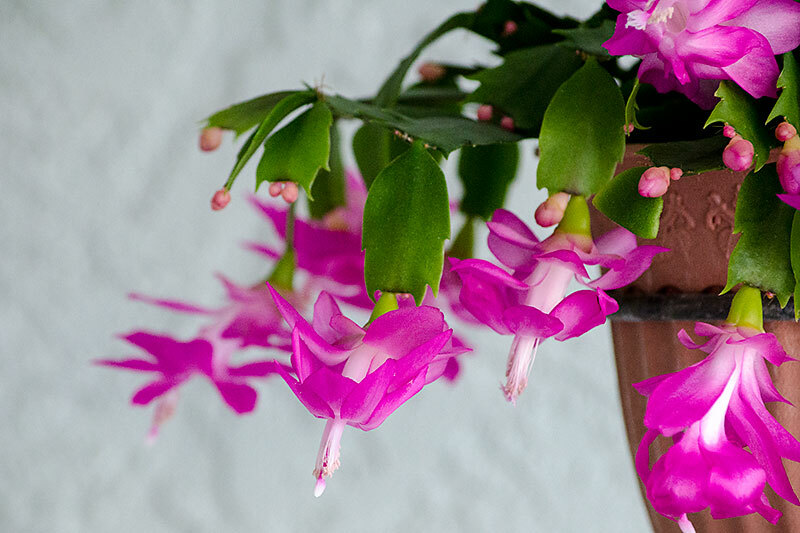 The Christmas cactus, which is also in the succulent family, is a little dear to my heart because my Christmas cactus is my longest living plant. I got a piece of a Christmas cactus that broke off a mature plant when I was about 14, took it home and rooted it in a glass of water, and it's been going ever since! I'm sad to say that I did almost kill this plant once by putting it outside in direct sun and forgetting about it. It got horribly sunburned and lost quite a few leaves, but I'm happy to say that it made it through and is still going strong! I love this plant because it's not only hard to kill but it has beautiful red or pink blooms, usually around Christmas or Thanksgiving, hence the name. These two plants seem pretty similar to me. They are both very easy to grow. They make great hanging plants! These might need slightly more light and water than succulents, so keep that in mind, but they are lush and beautiful and make your home feel fresh! Care instructions are easy enough, just place in a somewhat sunny location and water as needed. You can also trim them if they get too long with no harm done. Or you can find a creative way to drape them! I'm sad to say that I've never had much luck with long-term kitchen herbs. However, anything from the mint family is a different story! There are many different kinds of mint including peppermint, spearmint, chocolate mint, cat mint, and even lemon mint (also known as lemon balm). Mints are incredibly easy to grow. All you need is a sunny window, plenty of watering, and a wide pot. 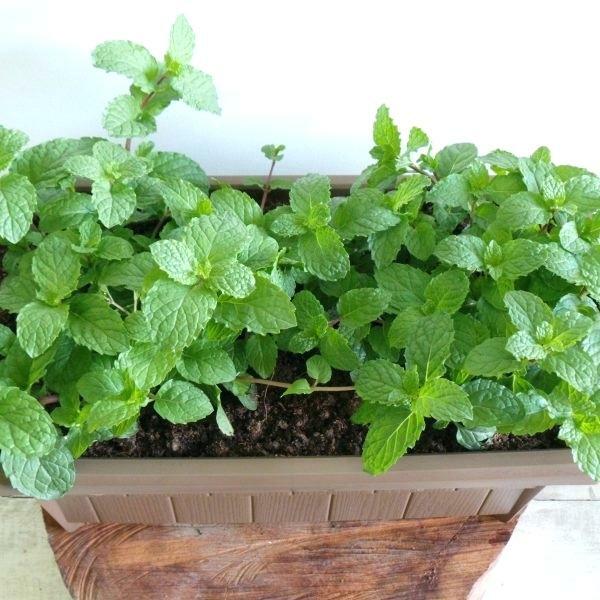 Mint will do fine in most pots, but I like to use wide pots because mint spreads vigorously. Give your mint plenty of water, trim the tops to encourage "branching" and soon you will have a nice little bushy plot of mint on your windowsill. One great thing about mint is that you can easily root cuttings. Just snip off a sprig and put it in some water. You should see tiny roots sprouting within a week or two. Tip: be patient at first and let your mint get established before plucking those leaves. Don't worry, you'll have plenty soon enough! I have a little succulent on my bedroom window sill , and an air plant in our kitchen. I was gifted a small rose plant and it’s thriving! I can hardly believe it. My friend is obsessed with succulents and cacti. I like them. I like them, but haven’t gotten any yet. So elegant orchids aren't for natural born plant killers? ☹️ I have read bathrooms are a great environment for orchids but I have no room in our teenie tiny 1 bathroom. Orchids are terribly expensive though. What we need is another full bathroom. Wait, make that a bit bigger house with 2 full bathrooms. Great post Sara! You have a way with words! Over a year ago I decided to buy the first plant for my room. I liked maidenhair ferns, so that's what I got. About a month after getting it I left it in a place in my room where the heater blew. It practically killed it. I watered it lots and cut off all the dead branches (I had never had a plant before, I was essentially going by some kind of instinct), and slowly it grew back. I now keep it mostly moist, mist occasionally, and fertilize it monthly. It isn't quite back to the level of fullness it was at when I bought it, but I think it'll get there. I now also have a completely trouble free heart-leaf philodendron. I tried ivy, but the spider mites almost killed it, so it's thriving as an outdoor plant now.